A 174 meter-tall windwheel (a 174 meter or 571 ft diameter) has been proposed for Rotterdam, the Netherlands second-largest city. It will be located in Rotterdam's harbor, nicknamed the Gateway to Europe. Looking vaguely like a high-tech version of the classic windmill, the Dutch Windwheel is a ring-shaped building, aesthetically inspired by the London Eye. It is being designed as a sustainable powerhouse, cutting-edge commercial hub, and as an attractive landmark. A trio of Rotterdam-based firms (DoepelStrijkers, Meysters, and BLOC), have invested in project, forming the Dutch Windwheel Corporation. The 174 meter tall, mixed-use structure will be made of two glass-and-steel loops. 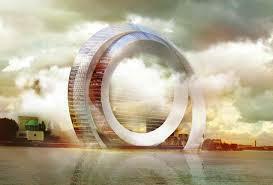 The Dutch Windwheel is a huge circular wind energy converter that houses a hotel, apartments, and a giant coaster ride. The structure is designed to be part energy resource, part tourist attraction, and part residential building. It should allow visitors to view the city. The cutting-edge, outer ring coaster will have approximately 40 rotating cabins. Each cabin will be outfitted with smart walls, providing information on every noteworthy sight visible from the revolving ride. The Dutch Windwheel is a very large circular wind energy converter that houses apartments, a hotel and a giant coaster ride. The concept is designed to be part renewable energy source, part tourist attraction, and part residential building. Holograms will act as virtual guides on 30 minute tours. Passengers will travel under water as part of the ride. While many tourists will be attracted to the Windwheel to experience it as a unique attraction, it is meant to be a dynamic showcase of clean technology. It will serve as a platform for demonstrating renewable energy solutions. One possible green solution is EWICON. EWICON is a technique that involves transforming wind energy into electricity without the use of mechanical moving parts. The technology creates energy through the displacement of charged particles by the wind in the opposite direction of an electrical field. Tubes run through the center of the 'wheel'. Each tube has several electrodes and nozzles which spray positively-charged water into the air, in a a process called 'electrospraying'. The projects designers also hope to integrate a network of heat pipes linking greenhouses, industrial institutions, and residential homes, called a Heat Roundabout. This system of heat pipes will help South Holland reduce the nations reliance on fossil fuels, and prevent the emission of pollutants into the air. Additionally, the structure will use closed water system, one capable of capturing rain and recycling all grey and black water..
Construction on the Windwheel is scheduled to begin in 2018, and end sometime between 2020 and 2022. Many of the developments details are still flexible and open to new green technologies. We dont know yet which innovations will [definitely] be applied. We want to work with the innovations of the future, not of today, Lennart Graff, of the Dutch Windwhell Corporation, explained. Graff says he and his team are still deciding which technologies to incorporate into the Wheel, a process involving discussions with a variety of organizations. Energy companies and tech firms, universities and developers have all provided input. Its a task that will take years to finish, especially since some of the concepts are still being researched and fine tuned. The buildings projected cost is still unknown, not surprising considering the many upcoming variables. At the moment we are working on a business planwhich includes the costs structurewith the municipality of Rotterdam, and until [it is finalized] this summer, we are not speculating on the developments overall price, Graaff said. If everything goes well, the initial expense wont matter too much in the long run. The buildings multi-functionality makes a solid business case, ensuring that it will be profitable in 10 to 15 years, he asserts. This seems a realistic claim, so long as the Windwheels engineers manage to achieve the majority of their goals. The Windwheel will use the innovative Electrostatic Wind Energy Converter (EWICON). It was developed from research done at Delft University. EWICON is based on a 2008 doctoral dissertation that concluded the system was capable of producing energy, but with very low efficiencies, 1.7% at best. While this is far less than the efficiency of a large wind turbine, the advantage of EWICON is there is no moving rotor. This means the building will not vibrate from the moving parts. Dhiradj Djairam is a member of the TU Delft team that developed the EWICON. He has said the Dutch Windwheel Corporation has expressed "a serious interest" in the technology. Djairam said he has provided an explanation of the technology and provided a rough outline for a research and development program. The Dutch Windwheel project has other renewable technologies, also. Photovoltaic thermal hybrid panels would contribute to the generation of electricity. The Dutch Windwheel Corporation says the building is designed to be built with local materials, and in a way that would allow it be disassembled and re-used in another location. electricity the Dutch Windwheel will be able to generate is not yet clear. According to the corporation, the project has been in development for almost two years, and talks to bring the concept to fruition are underway. Should it be realized, the company says it expects around 1.5 million visitors per year, and for the project to be profitable within a ten years.